I was finally able to afford some new goodies, so I ordered some things, including Scrapbook.com’s Mid-Century Floral, which is the kind of set I love playing with because there are just endless combinations that you can make with it. For a limited time, SAVE 30% on ALL Scrapbook.com Exclusive Photopolymer Stamps! These stamps are made of the highest quality photopolymer on the market and are designed by crafters, for crafters. They’re also manufactured and designed right here in the United States! 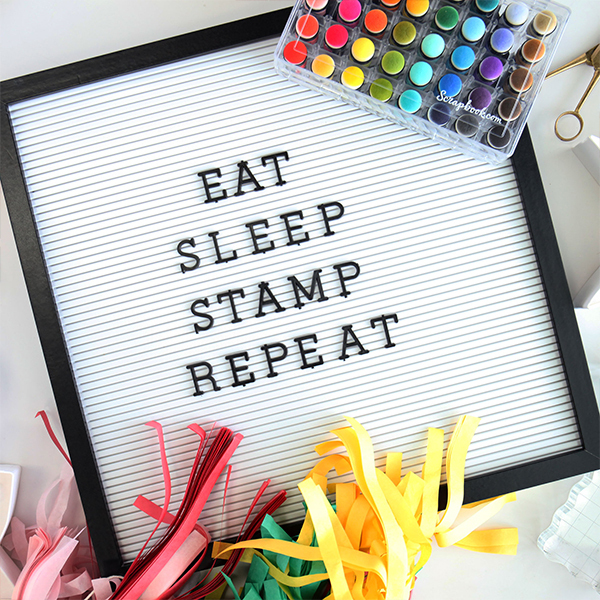 *SKU sbc-ds19-7 ‘Handmade Essentials’ Stamp Set is excluded from all discounts and promotions. GOJUS! I love these colors and the happy flowerscape I was able to create with the stamps. I love the sentiments in this set, which are all snarky and funny! I added some little dots of Nuvo White Blizzard drops for a little sparkle. I’m on a happy card roll! Mid-Century Floral reminds me a bit of a stamp set I got in my kit from SU! back in 2004 (except I like this one better, LOL). I used to like all that vintage-style stuff, and the style was something I was not used to using, but I found it extremely fun to stamp with. This set is even better than that!